A woman is capable of doing magic at any time. Some women even report feeling more powerful during their periods. Some women refrain from doing magic at certain points of cycles. Every woman is different. ArcherGirl: I think this is a great idea! My wife works closely with Michael the Archangel ans she agrees...sounds perfect. One suggestion we have is to buy two Michael cards, one to bury in the jar and one to have inside of your home, either by itself or on a small altar to Michael the Archangel, for further work. Please keep us informed on how its going. In my opinion it is not that women themselves vary so much but that different cultures have different traditions. Follow the traditions of your ancestors, if those feel right to you.Otherwise, study, learn, and join into the traditions of a different culture. Thanks Mary Bee and Catherine for your inputs. I guess its best to follow the ways of my ancestors so that they will be there to guide me in my work. Thanks again. Thanks Miss Aida...will look into the Goofer's Dust. Yes, I have only one St. Michael card, but I think I'd like to buy another along with a St. Michael candle. That's great advice, Joseph. Thank you! You're welcome. My wife and I are at the point where we are starting to buy multiples of certain cards to have around when we need them! I built a rearview charm, works great, throw in everything you can find for safe travels, ash, comfrey, 5 finger, mugwort, lodestone, salt (from cat's book) , plus sharks tooth, alligator tooth, law keep away, plus a host of strong protection plants. I also threw in eyebright so i can see whats coming. I just consecrate every time i have any close calls and i have nothing but good road luck. safe travels. Remember to include Wormwood into any Safe Travels work! Works very well for me. A copy of "Hoodoo Herb and Root Magic" will answer your questions about how to use these and other herbs. They have a reputation for effectiveness in keeping away unwanted vistors, including the law. I feel that one of my neighbors is dressing my yard when Im not home. I want to cleanse and then protect my home and yard area. Any suggestions? For protecting the grounds of your home, ConjureMan Ali has a Fiery Wall of protection sword spell that has been featured in a number of the Lucky Mojo Rootwork hours. You can look up the podcasts and take a listen. Hello again everyone. Since I have been reading this forum I have learned about a lot of "sneaky" tricks people do. Such as asking to use your bathroom and pulling hairs out of your hairbrush ... or sprinkling powders under the bath mat ... or putting a bit of oil on the drawer handles or doorknobs. Knowing this, the thought of letting my teenage daughter have a party brings out all sorts of paranoid "what ifs". We all know teenage girls can be hateful and jealous while smiling to your face, so I worry that hosting a party could be dangerous for my child. Then there is the question of one of the boys with a crush on her getting hair ... see the possibilities? Short of having a party in a public place, how could I have people in my home and protect my family from all the easy access it affords folks who may not really be our friends? I had thought about having party goers only use the half bath ( which would have NONE of our personal concerns in it). We would scrub it before hand to make sure there were no hairs on the counter or floor. What else can I do to make the party where possible enemies have "less access" to devilment? My plan so far is: Scrub everything with Chinese Wash and wipe down door knobs with Florida Water. Remove all personal items from party goer access like: hair brushes, make-up, shampoos; these things plus the dirty clothes hamper will be locked in my room. Burn a white candle during the party with a bit of Protection and Run Devil Run oil on it. Tell my child to not let people touch her hair if at all possible. Then do a complete house cleanse AFTER the party. Does anyone have any other practical Protection ideas, or advice to be more "on top of things" while people are milling about in my house? Adding Protection oil (or Fiery Wall of Protection) to your daughter's shampoo could help protect against her hair being used. Sprinkling red brick dust across your doorways, and/or planting 9 Devil's Shoe Strings across the path to your home could help ward off people who intend trouble. You could also dress a candle with Peaceful Home or Tranquility, or sprinkle Peace Water around, to create an environment that encourages everybody to be cool, instead of any nefarious plotting. Thank you for the reply Dr. Hob. The Devil Shoe Strings and red brick dust are used to keep evil people away, correct? So, if a person was planning on coming to the party to gather personal concerns, or lay down tricks, they might "get sick" or, for whatever reason, decide NoT to come in the house? I like that angle of protection! I'm partial to preventative measures. It reduces the amount of mess to be cleaned up, later. You could also hoodoo the REFRESHMENTS by serving homemade hot and spicy snacks and praying over the garlic and red pepper. Doesn't everybody love hot, vinegary Buffalo Wings with garlicky ranch dressing? MoonBreath wrote: Thank you for the suggestion Miss Michaele! I read through the link you sent and it has my head spinning with ideas. Hoodooing the snacks to repel evil is another layer of protection! Maybe I could bake some poppy seed bread with the prayer to confuse any "would-be" evil doers? Or lemon-poppyseed salad dressing ... or cake. Lemon is a cleanser, too. Say, do you have dark-colored carpet in your house? Sprinkle a few poppy seeds on the floor for them to step in. Hey Spiritual world, I wanted some help with a issue. Say for instance I and my girl just move and her family wants to come over to see how she is doing from another country. And you don’t want them to throw anything in your house to cause confusion, obstacles or for them to maybe drive us away or apart. I’m just trying to protect my home and my girl from anything. So I was wondering what are something’s I can buy to make sure my house is protected and secure until they leave? Lots of great information in this thread. My significant other and I are moving to a rental home a town over where the crime is a bit higher since it is located next to a campus. The neighborhood and landlords seem great, but there are the occasional break ins or thefts from the yard. I may end up working with devil's shoe string in the ground and/or the Chinese wash with fiery protection added in. Many years ago, I purchased an alligator head. I've heard hanging one over the door should protect from people entering. I was wondering if anyone had any further info on this? Since our move to Northern Virginia, my Dad is opening up about a great deal of his family. I am finding that the things I am interested in are things that he knows about. Now that he is finally getting a clue to my interests, my Dad is telling me about item, product and plant uses by his Mother and Aunts...I have hit family gold! Something that came up recently is the use of Red Devil Lye. He told me that they would boil animal left overs (he grew up on a farm in South Carolina) and make soap by adding this product. Can anyone tell me about other uses...? Thank You. Animal fat plus lye (or wood ash, which contains lye) is THE original recipe for soap. PapaGee is the one to go to for advice on that subject. 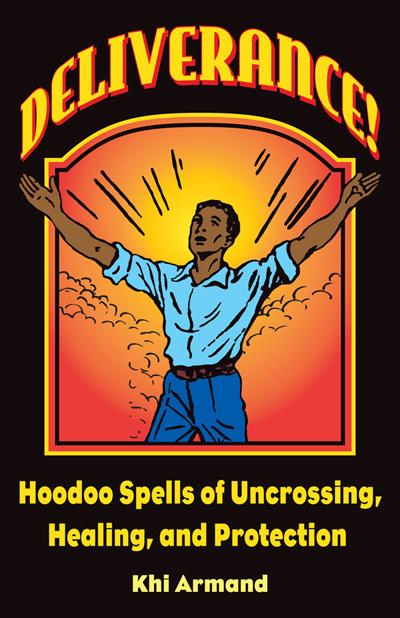 As to Red Devil Lye, however, its uses in hoodoo are protective, like other harsh, corrosive substances. My wife wanted to get rid of a flowerbed in front of our house, and while she was at it, she had them pull out the sidewalk from the driveway to the front door. We are in the process of building a new sidewalk using paving stones. I was wondering if there's an opportunity here? Something I could plant under the pavers to protect our home? Oh, gosh, there's an array of things you can do: Protection amulets, (I've heard of Small St Joseph Statues), etc. What would be the simplest spell to do for protection of the house and family before doing a wash-down of it? I have some Van-Van oil, all the Fiery Wall products, and some protective herbs. The main thing I'm worried about is 1) those who threaten the peace of the family, both within and without, 2) disaster, and 3) thieves and burglars; the number 1 is the one I'm most concerned about, and I'm not all that worried about the rest, except maybe tornadoes. My guess would be to go through the house with some white candles anointed with FWOP and Peaceful Home oil, and maybe some FW incense as well, top-to-bottom, front-to-back. Would that be a good, simple spell? Fumigating the house with FWOP incense is definitely a good simple way to put some protection on the house. You can also anoint all the door and window posts with FWOP oil. For working on keeping peace within the home you might want to get some Peaceful Home products (http://www.luckymojo.com/peacefulhome.html). You can sprinkle the powders in all the rooms or burn the incense as well. You might think about getting the kit to start the process and then once you have done that you can just maintain it with using the products periodically throughout the house. Thank you again, Natstein. I will definitely do that. Would adding some FWOP oil to the water used for cleaning the house help matters? I have been looking through this thread and my apologies in advance if it is redundant. I'm wondering if the same solutions for protection of the property, would be the same for protecting a loved one's grave? I ask because my mother passed away a few months ago and today when my father went to visit her grave, he said he had found boards and other random items around, near, almost ON my mom's grave. I know they have been doing some construction and other work there, but I found that extremely disrespectful. It angered him, naturally, and of course myself when he told me. I was wondering if there is anything I can use to form a barrier around that space so that no one messes with her grave or just tosses stuff around like that. Maybe they didnt mean any harm by it, but they still shouldve been a bit more considerate, as that is someone's place of final rest. Thank you in advance for the suggestions, advice. Have a great one. I appreciate yall. lonewolfinc, I am going to watch this post to see responses. This is a great concern, and may have been answered someone in the forum. I am going to do a quick search, and return if I find any relevant information. Thank you very much jwmcclin! I am still also looking around and looking in other topics to see if I can find something. I am abit slow right now, I admit. And yes, I am familiar with the Five Spot and I am fortunate that I do have Lucky Mojo's FWOP! Thank God. I have that and other oils, herbs, etc.. We have had people showing up and coming to our home uninvited and some not so good people, that I thought were friends. I have cleansed the house from back to front with Chinese Wash and Vinegar and Amonnia, Florida Water, Siete Machos, etc. as well as burned white sage and other peaceful home incense and even washed around with peaceful home wash. Outside, I have sprinkled black salt along with a mix of her graveyard dirt, my blood, and other protective herbs so that no one messes around our home too. It was storming badly earlier and lightning and very windy and rained abit, but all the while, I felt comfortable and felt no fear about it. It was as if, she was aiding it. I was thinking, maybe she was also angry that those people disrespected her grave. But I did my best to speak to her and comfort her. I was always protective of my mother, still am. I miss her very much. Thank you and thank everyone here for all yalls help. It is appreciated. Hello everyone. I need some advice. I have a enemy that keep trying to bring major problems and issues to my family. She keep doing work towards me and my man. She's messing with our money. And on top of that I think she has buried something in our yard. I really need all the advice I can get to basically clean our yard, and what to do to clear ourselves of what work she has done to us already. So our luck can build back up. I don't know where to post this question because I tried to start a thread to ask for help about protecting the car. So I came here as it's a thread about cleansing and blessing. Please, the moderation crew move this thread where it's correct because I don't know how and where start a thread about cars. If there are car protection threads I would appreciate your guidance. It's like my car wasn't allowed to be beautiful and well painted. That's why I wanted to start a thread here to ask for spells or any kind of help to protect cars as we want our homes cleansed and blessed. It would be nice having a thread about drivers who love driving and share spells and rituals to protect our "steel horses". Thanks everybody for guiding me. I moved your post to the car protection thread, as requested, but now it is late at night and i don't have time to reply. Maybe someone else will jump in. If not, i will reply later. The last two weeks in September someone put two foreign balls that are the size of a baseball and I believe that they could be fruit from another country. The first two were brown and dried out looking and they were placed under my air conditioner. I took a twig and knocked it off my window sill and it sounded hollow. Two weeks after that, someone replaced the two that I knocked down, with two green balls that were fresh but the same exact objects as the other items. A week later someone had knocked one of them down and crushed it onto my walkway and after 1 week they turned black. The other one I left it in my window to show that I wasn't fearful. Last Saturday it started getting cooler and I took my air conditioner out of my window and knocked the last ball out of my window. About 3 days later I see a thick, rusted, broken chain that is about four inches long lying in the walkway. I don't know what any of this means but it cannot be good. I am so sorry that this is so long but can someone tell me what this means and how I can help myself? I am just seeing your response. I am going to read those links and thank you so much for responding. Hello. I am going away for a few days. While I am away I want to protect my room and some other things I have in the house from an enemy that is friends with my roommate. I know she will come over once she finds out I am out of town and will possibly mess with my stuff like she has done before. What kind of protection spell can I do to make sure she does not come into my room? I'm sure others with more knowledge than me will jump in with some great rootwork advice...my instinct would be to reach for fiery wall of protection, salt and barberry, but I'm sure there's a lot more you could do. However, just from a practical standpoint, can you put a keyed lock/deadbolt on the door to your room? Put everything you want left alone in there, then remove the regular doorknob and replace with a doorknob with a lock of some sort? Even if you're not particularly handy, this is pretty easy to do; I have done so myself when I briefly lived with an untrustworthy roommate. bythebeautifulsea gave you great advise on protecting your property while gone. I would surely hide anything that is of value, and dust them with fiery wall of protection powder to keep them from being touched. Dressing your door, windows, lock with fiery wall of protection, pray the petition and prayer to God to ask to protect your stuff while gone. Barberry is great as discussed to prevent someone from doing something. You can also make a commanding jar to command the person to leave your stuff alone, add items such as calamous root, licorice root, essence of bend over powder, devil shoe string, any other items used in this method. You can add knot weed to hold the person down and prevent them from moving or doing something. A freezer spell to freeze them out of your stuff. I would even consider hot footing the person to keep them off of your property. These come in baths, incense, oils and sachet powders, you can burn the incense in the room, smoke the items, dress the items with oil, powder paper items with the sachet powders, dress candles with the oil to protect you, protect your stuff. Herbs above can be used in a mojo, used on candles, powdered and sprinkled around etc. Lot of information here, idea is to give you things to think about and how they can be deployed in a traditional manner in many ways to support your work. Such as dressing items, making a talisman or seal for protection, using candles for protection. I hope this helps guide you! Wow! Thank You guys so much for all your input. This is the first time I read your responses. New to this forum and I didn't have the notification box checked. Cant wait to read all of the links you shared JayDee . I am leaving town again for a few days so this will be very helpful.